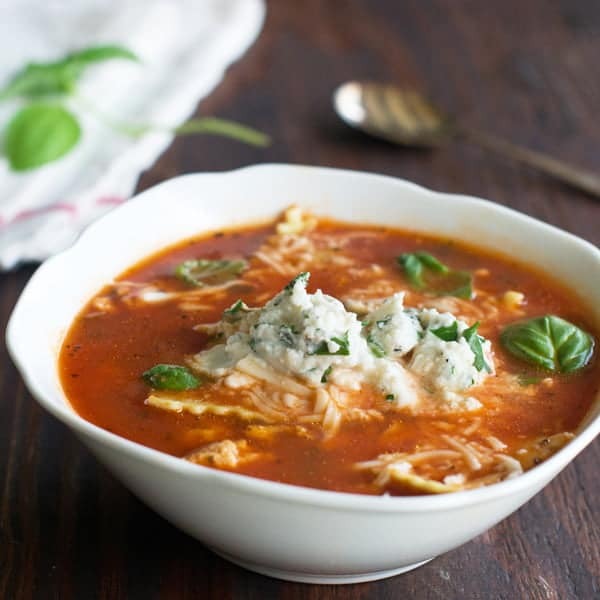 This Lasagna Soup is a perfect alternative to traditional oven-cooked Lasagna. Best part? It’s ready in only 15 minutes! Lasagna is a big favorite around here. I bet I could make it every night and it would get eaten up. The problem, of course, is that lasagna is time-consuming to make. I therefore can’t make it for my family every day, no matter how much they’d love me for it. So I’ve come up with some recipes that taste a lot like lasagna but are much quicker to make. When I’m in a real hurry I make Microwave “Spagagna”. I mix together leftover spaghetti, tomato sauce, ricotta and mozzarella in a big bowl and then put it in the microwave until hot, stirring occasionally. It’s spaghetti that tastes like lasagna. See: Spagagna! It sounds weird but it’s great. If I have more time, I sometimes make Lasagna Roll Ups. 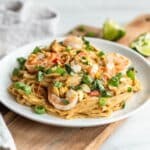 You do have to cook the noodles first to make these but then they’re quick. 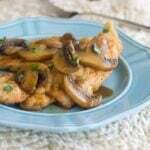 Here’s a recipe of mine for Chicken Cordon Bleu Lasagna Roll Ups. Or I sometimes just spread ricotta on the noodles, season with salt, pepper and garlic powder. Then roll them, top them with tomato sauce and cheese and bake until heated through. Way quicker than lasagna because the baking time is a lot less to get it heated through. 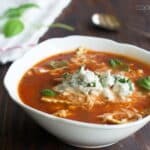 My most recent favorite way to bring lasagna flavors to my dinner table quickly is with Lasagna Soup. 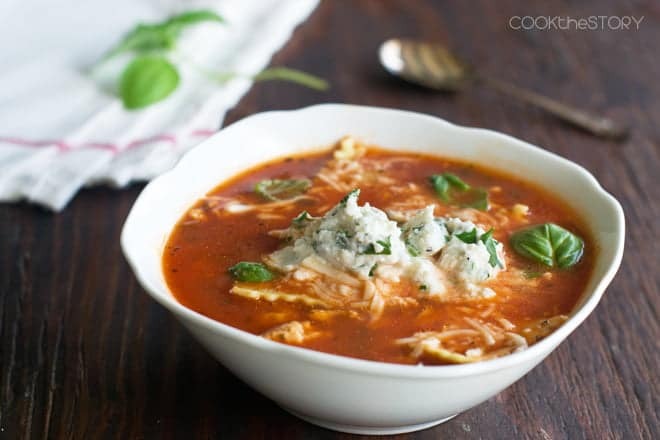 Awhile ago I made this lasagna soup from my friend Gina over at skinnytaste.com. I really liked it, especially the ricotta mixture that you dollop into each bowl of soup. Her recipe is definitely healthy and delicious. But it takes over 45 minutes to make. I wanted something quicker for our busy weeknights. So I altered the recipe a bit and made it into a SOUPin15 recipe. I’ll admit here that my recipe isn’t as healthy as Gina’s. I love that ricotta mixture too much and made lots more to dollop into the soup then she makes. Feel free to cut it back if you want it leaner. But trust me you’ll be wanting more of it if you do! 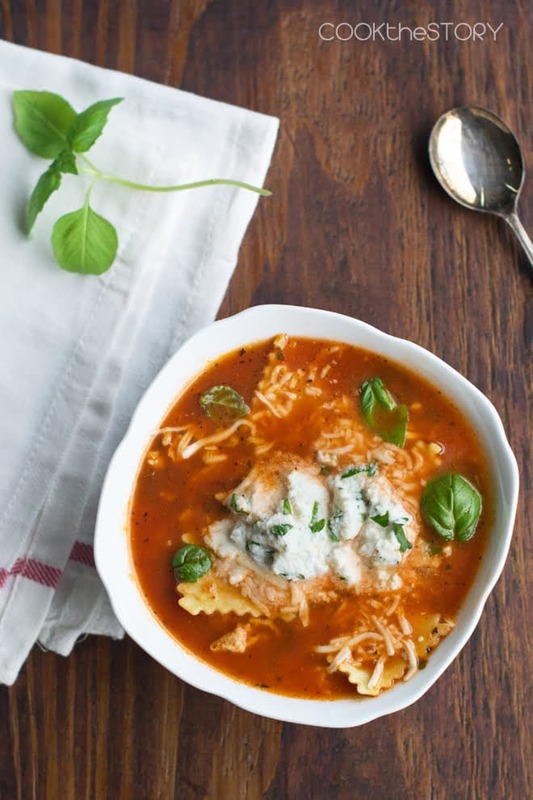 I like to use fresh cheese ravioli in my Lasagna Soup. 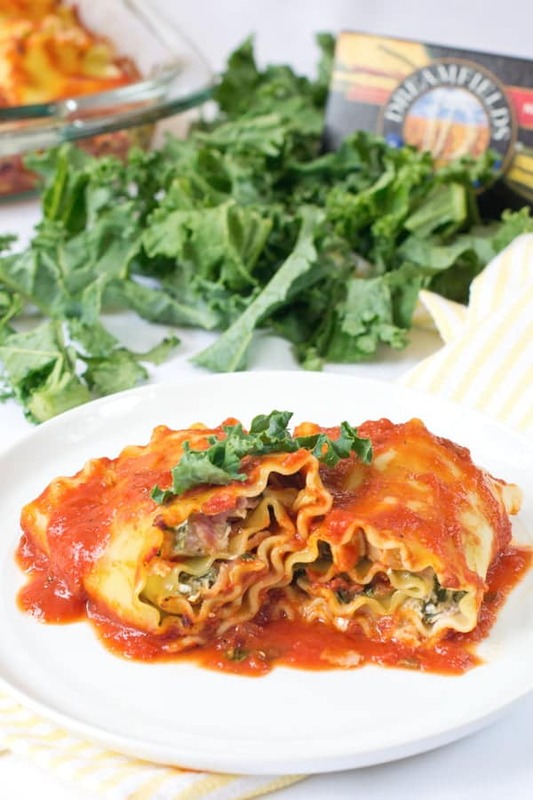 I find that it gives that layered texture and flavor that you get in a traditional lasagna. But I’ve also listed how much regular lasagna noodles to use if you want to go with that instead. First, it reduces the cooking time. A lot of the time when I make noodle soup the noodles are cooked in the soup after all of the other ingredients are added and the soup is simmering. This works great for small pasta shapes with a quick cook time. 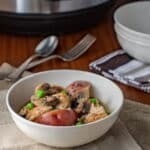 But if you have noodles with a longer cooking time, like the broken bits of lasagna noodles that you can use for this recipe, then adding them to the broth at the end adds a good 10-12 minutes to your cooking time. If you instead put on a pot of water to boil at the very beginning and get your noodles into it, they’ll finish cooking while you build the rest of the soup. Drain the noodles, add them to the soup and you’re done. Second, if you anticipate having leftovers then cooking the noodles separately is always the way to go. If you cook the noodles in the soup then they stay in there in the fridge and keep soaking up liquid until they’re mush. Instead, cook them separately, drain them and then toss them with some cooking oil so that they don’t stick to each other. To serve, I put the noodles in a soup bowl with hot tap water for a minute. Then drain off the water and add your hot soup. No mushy noodles here! And now, the recipe! All the flavors of Lasagna for dinner tonight in under 15 minutes. 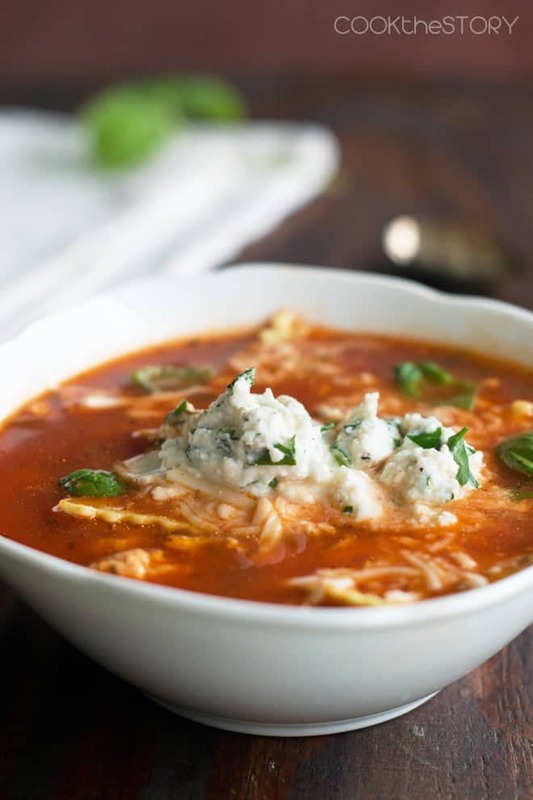 This Lasagna Soup is a perfect alternative to regular oven-cooked Lasagna. Best part? It's ready in only 15 minutes. Fill a medium saucepan with hot tap water. Put the lid on and heat it to boiling over high heat. Cook the pasta in the boiling water according to package directions. Drain. Meanwhile, heat olive oil in a large pot or Dutch oven over medium-high heat. Add the ground turkey, ½ teaspoon salt, ¼ teaspoon black pepper and dry oregano. Use wooden spoon to mix it and break it up. Cook stirring occasionally until turkey is white on the outside, 2-3 minutes. While the turkey cooks mince the garlic cloves and chop the parsley. To the turkey add all of the garlic and half of the parsley along with the broth and tomato sauce. Stir. Increase heat to high and cover. Stir occasionally until it reaches a simmer. Turn heat to low. Meanwhile, chop most of the basil (keep 6-8 leaves aside for garnish) and put it in a medium bowl with the ricotta, remaining parsley, Parmesan, garlic powder, ¼ teaspoon of salt, ¼ teaspoon of coarse black pepper. Stir. Taste. Add more salt and pepper if desired. Divide the pasta among soup bowls. Top with the soup. Then to each bowl add a scoop of the ricotta mixture, a good sprinkle of shredded mozzarella and a couple of the reserved basil leaves. Yay! Thanks for letting me know, Hannah! This looks amazing! I’m guessing it makes about a half gallon? Thinking about scaling this up to feed 60 people at church and trying to decide how much to make. Pat, I think it probably makes a bit more than that. There’s 4 cups of broth and 3 cups of tomato sauce and then all the noodles. I’m guessing closer to 10 cups (1 and 1/4 gallons). If this is one of several things on offer at your event, I’d make 5-6 times the recipe. If this is one of the only things, then you’d need to do 8 times the recipe, probably. But note, when I make food for a crowd, I ALWAYS have tons leftover. So I might not be the person to ask! Ohhh now this is what I needed for tonight as I was rushing to make dinner as Ben got ready for night shift!! Perfection! 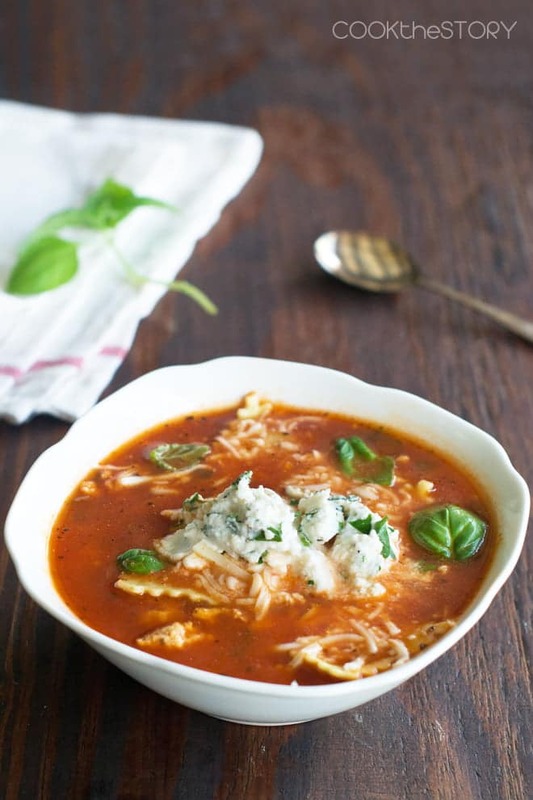 What a delicious, hearty soup! I love lasagna but, well yeah, takes too long! This is the perfect solution!